One of my favorite things about Linux is that it has become not only the platform of choice for many projects, but it also tends to inspire an entire ecosystem of open-source solutions. It's almost as if, when the operating system is free, it only makes sense that the things built on top of it are free too. 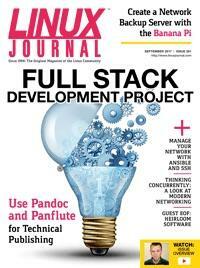 In this September issue, you'll see the all-encompassing Linux environment in action. First up is Reuven M. Lerner, who is discussing scaling applications to handle simultaneous connections. Anyone who has waited in line to get into an amusement park knows that the only way massive throughput works is if there are multiple "lanes" working together at the same time. That concept is demonstrated perfectly in web applications, and Reuven explains how. Dave Taylor follows with a bit of advancement on scripting dice rolls. He described a simple dice game last month, but what about dice that have more than six sides? Dave's article will expand your dice knowledge while making you better scripters at the same time. Backups are a passion of mine, and thankfully it's a topic Kyle Rankin and I agree is vitally important. This month, Kyle demonstrates a low-power way to create a fast and effective backup system using a Banana Pi. A similar thing could be done with Raspberry Pi, but the Banana is a bit faster, which is ideal for backups. I help make things faster this month too, but rather than dealing with backups, I continue my series on Ansible. I love using Ansible, because it thinks like a system administrator, which happens to be the way I think too! I mentioned earlier that Linux is great for "Soup to Nuts"-type projects. Kyle demonstrated that with his backup system, but John S. Tonello goes even further by explaining the "Full Stack" concept. Being able to develop an application is a desirable trait for many employers, but if you can handle every aspect of development and deployment, it makes you (and your app) far more valuable. John explains how the Full Stack idea works by walking through the development of an app you can see in action today! Lee Phillips addresses a topic that is near and dear to my heart—specifically, writing. Most people know documentation is that thing we all value, and yet so few of us do it well. Using Pandoc and Panflute, Lee walks through creating a publishing pipeline that takes most of the frustration out of technical writing, allowing you to focus on the actual writing itself. Anything that makes technical writing easier is a benefit to our entire community, so be sure to check out his article. Linux is the perfect platform for experimentation, application and education. Whether you want to build a web application from the ground up or literally want to create an interactive application for sharing soup and nut recipes, Linux really shines. As always, we've included product announcements, reviews, tech tips and countless other useful bits of Linux-related information. We hope you enjoy the issue as much as we've enjoyed putting it together!